Infrastruktur transport. Hestevogne, sporvogne, toge, biler, fly etc. Foto fra den billedindsamling, som FDM deltog i ca 1977, "Danmarks ældste bilfoto", hed konkurrencen vistnok. Har ingen historie om det. (Uffe Mortensens samling). 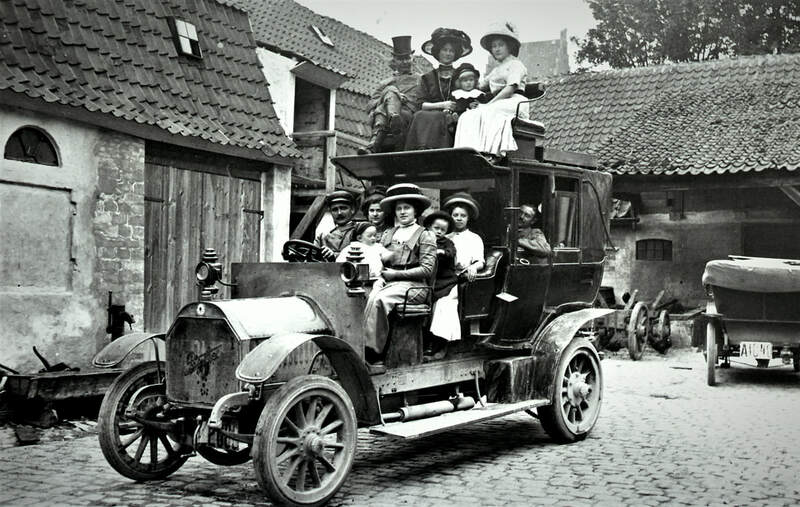 Steen Christensen: The passenger car or minibus is a "Thrige P13" made from 1911 by Thomas Barfoed Thrige, Odense, Denmark. It was called a "Tourist Car" and could be equipped with various bodyworks. "Triangel" denoted the merger of the automobile factories Thrige, Anglo-Dane and Jan, who, at the request of their joint banking association, Landmandsbanken, had to merge in 1918 and then named The United Automobilfabriker A / S, led by Thomas B. Thrige. Triangel became a big and important brand in buses, railroad motor cars and heavy lorries, well-suited to the combination of good quality and strict import restrictions, Triangel was a proud brand until the closure in 1958.